Harsha or Harshavardhana (हर्षवर्धन) or "Harsha vardhan" (590–657) was an Indian Rajput emperor who ruled Northern India for fifty seven years. He was the son of Prabhakar Vardhan and younger brother of Rajyavardhan, a king of Thanesar. He was born into a royal family of the Bais Rajput, a royal Rajput clan. At the height of his power his kingdom spanned the Punjab, Bengal, Orissa and the entire Indo-Gangetic plain North of the Narmada River. After the downfall of the Gupta Empire in the middle of the sixth century C.E., North India reverted back to small republics and small monarchical states. 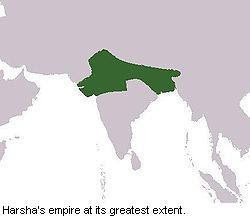 Harsha united the small republics from Punjab to Central India, and they, at an assembly, crowned Harsha king in April 606 AD when he was merely 16 years old. The origin of Harsha's ancestors is obscure and little is known about them. According to Banabhatta, Harshaćárita they were descended from a certain Pushpabhuti who founded and ruled the kingdom of Sthanvisvara or modern Thanesar, an ancient Hindu pilgrimage centre and one of the 51 Shaktipeeth's, now a small town in the vicinity of the newly created Kurukshetra in the state of Haryana north of Delhi. The name Pushpabhuti is the key to Harsha's origins and the relevant reference point is an inscription dated 181 AD and found at Gunda in the state of Gujarat. That inscription mentions a general of Rudrasimha I or Rudrasingh by the name Rudrabhuti. Rudradaman I, an ancestor of Rudrasimha I had conquered the Yaudheya, who were the original masters of Haryana. The famous Chinese Buddhist pilgrim monk, Xuanzang, states that Harsha was a 吙舍 feishe or of the Vaishya caste but makes no comment about his family's origins. According to Alexander Cunningham, in 1871 Xuanzang must have mistaken the Vaisa for Bais Rajput. Thomas Watters has pointed out this is most unlikely as Xuanzang, "had ample opportunities for learning the antecedents of the royal family, and he must have had some ground for his assertion." However, Banabhatta clarifies that the Bais Rajput descent must have been correct considering the Harshacarita the author Bâna never stated his background to be strangely non Kshatriya. Harsha's Royal descent being known (rulers of Sthanvisvara, modern Thanesar) and his sister being married into prominent Kshatriya families of Maukharis. (a highly contentious occurrence, had Harsha's family not been of royal or Kshatriya descent). 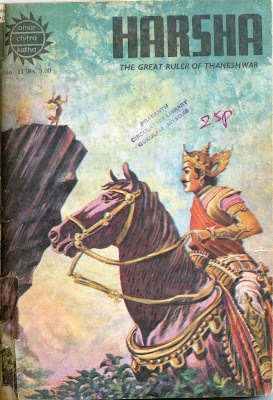 Moreover, upon his formal coronation ceremony, Harsha took the title Rajputra. After the downfall of the Gupta Empire in the middle of the sixth century CE, North India was split into several independent kingdoms. The Huns had established their supremacy over the Punjab and parts of central India. The northern and western regions of India passed into the hands of a dozen or more feudatory states. Prabhakar Vardhan, the ruler of Sthanvisvara, who belonged to the Pushyabhuti family, extended his control over neighbouring states. Prabhakar Vardhan was the first king of the Vardhana dynasty with his capital at Thaneswar. After Prabhakar Vardhan’s death in 606 CE, his eldest son, Rajya Vardhan, ascended the throne. Harsha Vardhana was Rajya Vardhan’s younger brother. This period of kings from the same line has been referred to as the Vardhan dynasty for distinction purposes in some publications though the dynasty was not necessarily known as the Vardhan dynasty in its era. Rajya Vardhan’s and Harsha’s sister Rajyasri had been married to the Maukhari king, Grahavarman. This king, some years later, had been defeated and killed by king Deva Gupta of Malwa and after his death Rajyasri had been cast into prison by the victor. Harsha's brother, Rajya Vardhan, then the king at Thanesar, could not stand this affront on his family, marched against Deva Gupta and defeated him. But it so happened at this moment that Sasanka, king of Gauda in Eastern Bengal, entered Magadha as a friend of Rajya Vardhana, but in secret alliance with the Malwa king. Accordingly, Sasanka treacherously murdered Rajya Vardhan. On hearing about the murder of his brother, Harsha resolved at once to march against the treacherous king of Gauda and killed Deva Gupta in a battle. Harsha ascended the throne at the age of 16. Though quite a young man when he came to power, Harsha proved himself a great conqueror and an able administrator. After his accession, Harsha united the two kingdoms of Thanesar and Kanauj and transferred his capital from Thanesar to Kanauj. Harsha defeated Shashanka, the ruler of Bengal. He also brought Bengal, Bihar and Orissa under his control. He conquered Dhruvasena of Gujarat and gave his own daughter in marriage to him. He also conquered Ganjam, a part of the modern Orissa State. Harsha's ambition of extending his power to the Deccan and Southern India were stopped by Pulakeshi II, the Chalukya king of Vatapi in Northern Karnataka. Pulakeshi defeated Harsha's army on the banks of the river Narmada in 620 AD. A truce was agreed upon and the river Narmada was marked as the southern boundary of Harsha's kingdom. Harsha's father, Prabhākara was, apparently a sun-worshipper and of Bargujar clan, his brother followed Hinayana Buddhism while, according to Bana, Harsha himself was a Mahayana Buddhist. Harsha was a tolerant ruler and supported all faiths - Buddhism, Hinduism and Jainism. Early in his life, he seems to have been a follower of Sun Worship, becoming a patron of Shaivism and Buddhism later on. His sister Rajyashri's conversion to Buddhism presumably had a positive effect on his support to the religion. His approach to religion is evident in his celebrated play Nagananda. The play's theme is based on the Jataka tale of the Bodhisattva Jimutavahana, but Harasha introduces the Goddess Gauri, Shiva's consort, as the saviour of Jimutavahana, a feature not found in the Jataka. According to the Chinese Pilgrim Xuanzang, who visited his kingdom in 636 CE, Harsha built numerous stupas in the name of Buddha. Xuanzang entered a grand competition organized by Harsha and won the theological debate. Harsha also became a patron of art and literature. He made numerous endowments to the University at Nalanda. Two seals of Harsha have been found in Nalanda in the course of the excavations. All these favours and donations of the great emperor were crowned by the construction of a lofty wall enclosing all the buildings of the university to defend the institution from any other possible attack. In 643 he held a Buddhist convocation at Kanauj which was reputedly attended by 20 kings and thousands of pilgrims. In 641, following Xuanzang's visit, Harsha sent a mission to China which established the first diplomatic relations between China and India. The Chinese responded by sending an embassy consisting of Li Yibiao and Wang Xuanze, who probably traveled through Tibet and whose journey is commemorated in inscriptions at Rajagriha - modern Rajgir, and Bodhgaya. Harsha was a noted author on his own merit. He wrote three Sanskrit plays – Nagananda, Ratnavali and Priyadarsika. His reign is comparatively well documented, thanks to his court poet Bana and Xuanzang. Bana composed an account of Harsha's rise to power in Harsha Charitha, the first historical poetic work in Sanskrit language. Xuanzang wrote a full description of his travels in India. Harsha died in the year 647 AD. He ruled for 57 years. After Harsha's death, apparently without any heirs, his empire died with him. The kingdom disintegrated rapidly into small states. The succeeding period is very obscure and badly documented, but it marks the culmination of a process that had begun with the invasion of the Huns in the last years of the Gupta Empire. Neither Bana's nor Huan Tsang's account gives any details of this period. A few tantalising glimpses are offered in some ancient Chinese and Tibetan Books. The one in the Tibetan book The White Annals tells that Harsha had sent an envoy to the Chinese Emperor, who in turn sent a Chinese one(named in the Chinese sources as Wang Xuance) with a convoy of thirty horsemen. When they reached India they found that Harsha was dead and his minister Arjuna had usurped the throne. Arjuna is said to have been persecuting the Buddhists and attacked the envoy who had to flee to Tibet. The Tibetan king decided to avenge the insult to the Chinese emperor and sent the envoy back with an army that finally managed to defeat and take Arjuna and his family as prisoners, and sent them back as prisoners to the Chinese emperor. Historians have not yet managed to unravel what the facts were from these meagre accounts. 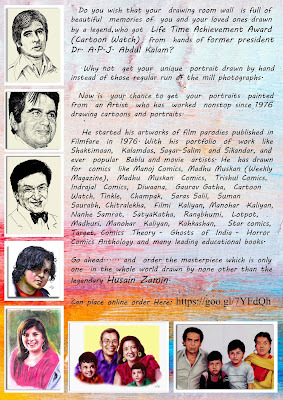 Rajeev Sharma: You are always welcome! I've special affection with this title as it’s name of mine son too. PEOPLE ESPECIALLY HINDUS HAVE FORGOTTEN OUR Ancestor mecca is to Muslims India is for hindus. Harsha was crowned in 606 Ad and he died in 647 AD , he ruled for 41 years. He was 57 years when he died. Please correct the details in the article above.